The first four volumes of a new series, Terra Foundation Essays, focuses on four distinct themes: Picturing, Scale, Circulation, and Experience. They should be understood as only the most recent reflection of a broader phenomenon within the field of American art. Indeed, thematic surveys of disciplinary knowledge are not new. Recently, more art-historical texts are conceived to mix the viewpoints of international rosters of scholars on some shared topic. Taken together, these might make the impulse to study individual artists and single objects seem quaint, or even irrelevant. In fact, diverse, multiauthored approaches to art history can serve to strengthen scholarship both within and beyond the Western canon by increasing the awareness of plural perspectives in our field. That is one clear benefit of editors seeking out the widest conceivable variety of approaches. The results have been fresh, unquestionably more complex, and as Barbara Maria Stafford once memorably put it, energize the humanities as a whole “by acknowledging overlap and interplay.”1 In recent years, historians of American art have gained from the self-conscious expansion of critical vocabularies, internationalization of dialogues, and the deployment of bigger toolboxes. At the very least, such scholarship has helped us to identify fertile new terrain and define alternative, complementary directions within our ranks. It is worth underscoring that the proliferation of fundamentally cross-disciplinary, transatlantic exchanges of ideas about North American objects within global contexts has been at least partly sponsored by museums, or by the research institutions more or less closely affiliated with them.2 Full assessment of the significant role of the Terra Foundation in funding the Terra Foundation Essays, volumes one to four, which comprise close to one thousand pages of new scholarship by twenty-seven different scholars, is probably not practical in a review article of normal length, and is something I will not pretend to provide here. Still, any attempt to evaluate the overall impact of the Terra’s latest praiseworthy idea ought to begin by identifying available models for such a project. To start, the occasional interest taken in both traditional and cross-disciplinary approaches to American art history since the late 1960s by editorial boards of the legendary National Gallery of Art Studies in the History of Art publication program is noteworthy.3 In a similar vein, American Icons: Transatlantic Perspectives on Eighteenth- and Nineteenth-Century American Art was one of the first volumes to inaugurate the long-running Getty Research Institute publication series, Issues and Debates, which began in 1992.4 Finally, the published series produced by the Whitney Museum of American Art, Views from Abroad: European Perspectives on American Art, although shorter-lived and fundamentally based in late-1990s curatorial practice, also merits recognition.5 Other serialized offerings ranging from the Paul Mellon Centre, Studies in British Art to the Whitechapel Gallery, Documents of Contemporary Art have made the production of multiauthored dossiers about specific themes mainstays of their institutional publication programs. How much does the latest effort by the Terra Foundation, then, depart from or build upon these prior examples, stretching back across several generations? In the case of the initial four volumes from the Terra Foundation discussed here, a partial parallel can be traced between the specific institutional siting of Dia and the experimental residency program that has operated under the auspices of the Terra Foundation in Giverny, France, since 2001.8 Many, although certainly not all, of the authors included in the series have participated in the Terra Summer Residency as senior advisors or as doctoral fellows, or as guests of the foundation’s Paris Center (open since 2009), or the Terra programs and events at the home base in Chicago.9 This extended circle of distinguished scholars provides a basis for the Terra Foundation Essays and, if the first batch of publications is any indication, a deep bench for creating the volumes yet to come. The effort to “illuminate and explore a selection of ideas that have been particularly salient within the production and consumption of art in the United States over three centuries” guides the series. That editorial viewpoint extends to a promise that the contributions in “each volume expand the conceptual and methodological terrain of scholarship on American art by offering comparative models and conceptual tools relevant to all scholars of art history and visual culture, as well as other disciplines in the humanities.”10 The premise of transnational exchange is what distinguishes this effort—and so many others of the Terra Foundation—from the aforementioned models for serialized essays. Moving away from this brief historiographical introduction, and with this “mission statement” in mind, the focus on what this quartet of volumes has actually delivered in terms of new scholarship and their potential for lasting relevance to the field of American art history will be addressed. The individual titling of the first four volumes of the Terra Foundation Essays series is deliberately succinct: Picturing, Scale, Circulation, and Experience. These terms are familiar but ultimately vague nouns, without obvious sequential logic, that offer an elastic approach to the authors’ fulfilling the task of contributing and affording maximum room for meeting the expectations of a wide readership. This much is evident from the introductions to each volume, which can be read as stand-alone critical contributions. The similarly minded editors express how each of these themes provide a new lens for penetrating the visual world and for focusing scholarly inquiries. In so doing, the editors all seem to share a presentist appreciation for American art as a specialization whose history is at odds with current trends of incorporating geopolitical, transhistorical fields of concern. 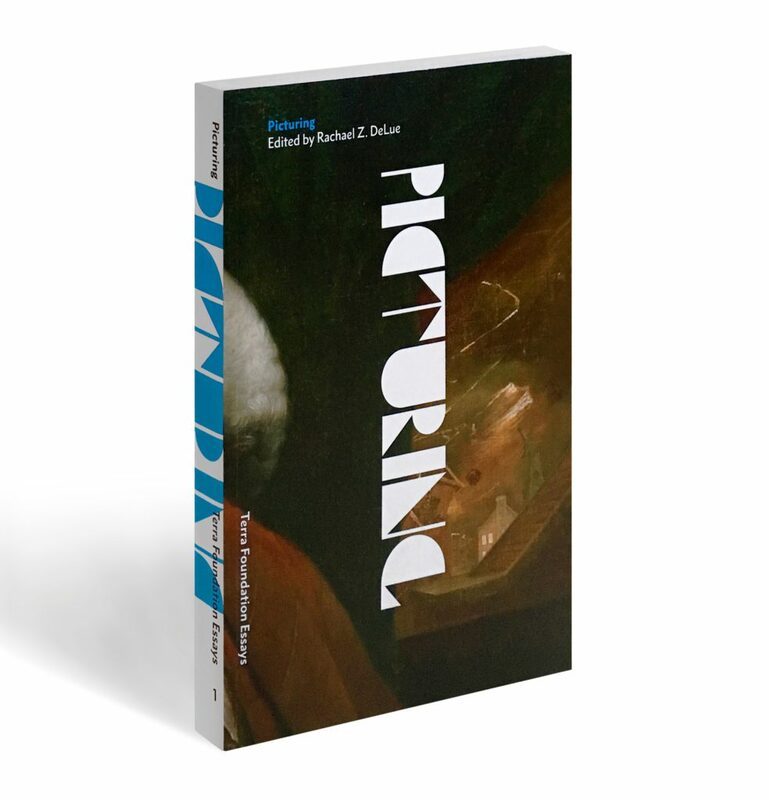 In the first volume, Picturing, Rachel Z. DeLue—who also serves as the series editor for the Terra Foundation Essays—argues convincingly that the essays that follow her remarks “challenge the prevailing assumption that thinking about pictures in the United States always hewed closely to the precepts of European art treatises” by paying “particular attention to the transit of ideas across the Atlantic while also revealing the unexpected complexity and . . . sheer strangeness of thinking about picturing in the American context” (28). In the introduction to the volume Scale, Jennifer L. Roberts thinks along much the same lines, remarking that “the material and political relations indexed by scale in American art are not limited to the domestic realm. These relations have always also been international. Indeed, within and around American art and literature, scale has long been a key language of international relations” (20). François Brunet similarly claims that “when circulation is chosen as a theme for an installment in a series aimed at outlining key concepts in the field of American art history, its particular contemporary prevalence cannot in itself dictate the terms of a discussion that must reach far and wide” (Circulation, 13). Only Alexander Nemerov, the editor of the most recently published volume, Experience, seems less persuaded that the move to situate the field in a context that enjoys a critical lingua franca might be a worthy goal in and of itself. This is unsurprising, given his insistence upon the personal, creative nature of art-historical writing as a record of “real experience.” Nemerov uses his own provocative introduction to remind us that: “Academics live and die on their ability to be part of a discourse, to write sharable insights and arguments that become part of accepted ways of thinking. Trends and currents and convictions, such as ‘affect,’ or ‘race,’ or ‘the global,’ or ‘the ecological,’ give coherence and relevance to individual accounts—sometimes to good effect.” Nemerov then adds, “But, at the heart of these inveterately communal types of scholarship are personal insights that the writers in question then transmute to wider applicability with, unfortunately, a loss of remarkable experiences and sensibilities” (21). This moment of doubt—a worry about what gets sacrificed in the name of broadly shared scholarly goals—poignantly rings in the sometimes polarized academic environment of today. A poetic tone, tinged with his own experience of regret, sounds throughout Nemerov’s introduction and establishes his agenda somewhat apart from the other editors of the Terra Foundation Essays. The separateness of the Experience volume from the rest of the series is worth returning to later, but for the moment, it is enough to underscore that the editors seem otherwise unified in their enthusiasm for the flexible possibilities of their titles. Picturing runs the gamut from Winslow Homer and Eadweard Muybridge to Sir Joshua Reynolds and Paul Cézanne. The volume begins with DeLue’s elaboration of the interplay between observation and image creation. Her text uses familiar examples from Winslow Homer’s repertoire of self-situation—the sinking of paws and signature in the Fox Hunt (1893; Pennsylvania Academy of the Fine Arts) and placement of the painter/viewer directly in the line of fire in Right and Left (1909; National Gallery of Art)—as demonstrations for considering the artist as the first observer of a picture’s meaning. DeLue usefully introduces German Bildwissenschaft (image theory) to her discussion of how “the structure of images . . . rather than simply recording visual experience or data, construct the visual” (23). In itself, this observation feels intrinsic to twentieth-century art-historical methods, but in the context of the five subsequent essays, it highlights the elaborate theoretical thread that can be traced through the representational dynamics of Reynolds (Matthew C. Hunter), Mason Chamberlin (Michael Gaudio), Muybridge (Elizabeth Hutchinson), and Cézanne (Ulla Haselstein). The final essay of the volume, “Pictorialism as Theory,” by Robin Kelsey, provides a coda to DeLue’s theoretical introduction by reconstructing different categories of making art, from Leon Battista Alberti to Jeff Koons. If this program sounds ambitious, it unquestionably is. Readers’ heads may swirl with multiple understandings of what is actually meant by the term “picturing” long after they finish reading the volume. Such variety is a strength—and perhaps the chief virtue—of the overall contribution of the Terra Foundation Essays. Instead of settling definitions for these themes once and for all, what lingers most is a sense that these terms must remain mutable and unstable. For example, Hutchinson’s essay, “Conjuring in Fog: Eadweard Muybridge at Point Reyes,” demonstrates the value of this broad approach. 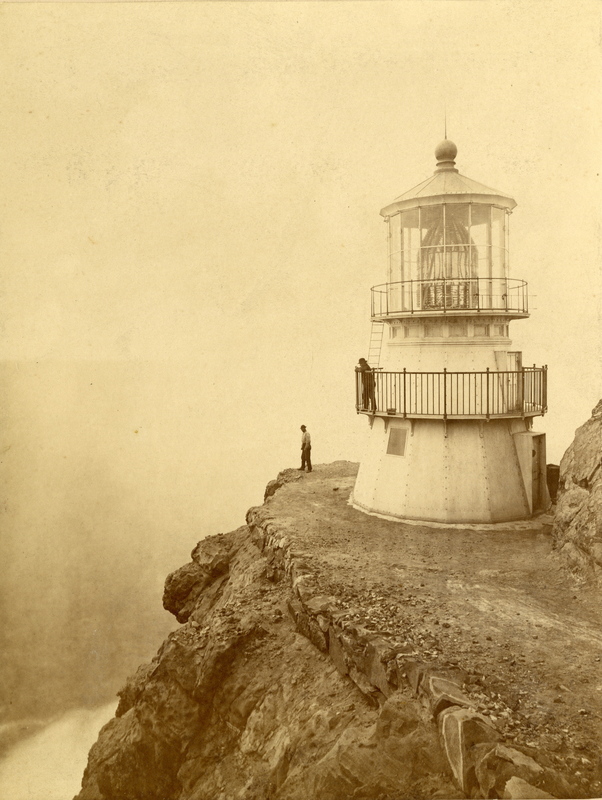 Hutchinson connects a small set of often-overlooked landscape images that the English-born photographer made in Marin County, California, to Burkean ideas about the sublime and to the technical limits of photography in the 1870s. The author acknowledges, but also seeks to complicate, the approach of many art historians who have myopically considered such nineteenth-century depictions of American landscapes as tools for exercising close control over undifferentiated geographic “territory.” Against the popular reading of these landscapes as informed by and framed within ideals of Manifest Destiny, Hutchinson offers Muybridge’s depictions of Point Reyes as a counter example, one where failure and error bump up against the “material challenges . . . of the photographer’s job.” Instead of revealing “mastery” over a treacherous stretch of the Pacific’s coastline, Muybridge’s images are understood as ongoing “negotiations” that have only ever brought partial control to Point Reyes and other similarly liminal places (121–26, 144). Through her close readings of Muybridge’s images (fig. 1), application of Kelsey’s canny ideas about the material conditions of photography, and her incorporation of Coastal Survey documents and period photographic manuals, Hutchinson argues that “capturing fog” was an indomitable fact of making prints in the wet plate era. This fact can—in Hutchinson’s view—stand as an illuminating lesson for picture-making practices today, including, or perhaps in spite of, the dominance of digital media. Taken together, the contributions of Hutchinson and the other authors of this volume offer ceaseless encouragement for further revisions of American art history, beyond their initial framing identifications. From this first volume forward, the essays within the Terra series make good on their promise to expand the vision of American art history to include insights from adjacent specializations and fields thought wholly apart. Like the essays collected in Picturing, the six texts that comprise Scale cover broad territory. In “Seeing Scale,” Jennifer L. Roberts treats the keyword of the volume as “a powerful tool for historical analysis because it is a relational concept, one that is acutely responsive to specific historical formulations of normalcy, standardization, hierarchy, variation and conflict” (23). While Roberts’s own expertise in the image-traffic that prevailed in British America through the early nineteenth century might equally have suggested her as a coeditor for the volume on Circulation, her appreciation for concepts of scale shapes and enhances this volume.11 While Roberts avoids the temptation to organize the book sequentially, it may be helpful here to discuss the six essays collected—whose range includes the politicization of colonial markers (Bellion), arctic exploration (Heuer), colossal spaces of the early twentieth century (Weems and Grigsby), Abstract Expressionism (Davidts), and the monumental aspirations of our own contemporary moment (Adamson and Stein)—in something that is the reverse of chronological order, if only to emphasize potential pedagogic value. A discussion of contemporary monumental sculpture initiates an inquiry within Scale into how objects relate to us, one another, and their surrounding social spaces. Glenn Adamson and Joshua G. Stein bring a learned curatorial perspective—practically speaking, almost unique among the authors represented in this series—to their interesting essay, “Imprints: Scale and the Marker’s Trace.” Wouter Davidts takes Barnett Newman’s “zips,” the painter’s own theoretical reflections, and images of artists in front of their works, as points of departure for his discussion of scale as a prime factor in postwar American art. New relationships to the onlooker reside at the core of Davidts’s efforts to reconcile Newman’s intellectual and painterly effort to clarify “a world already full of objects, on the one hand, and bewildered by the horrors of World War II, the Holocaust, and the atom bomb, on the other” (163). Darcy Grimaldo Grigsby, whose prior work on scale and photographic imagery create high expectations for her contribution, discusses Gutzon Borglum’s large-scale projections onto the face of Stone Mountain as a quixotic effort, freighted both by technological challenges and ideological baggage.12 Many may know that the American sculptor’s effort to monumentalize Robert E. Lee and the Confederacy was fraught from the start and was ultimately left unfinished. Less well understood is the fact that what is visible today in Georgia is mostly the work of other sculptors—Augustus Lukeman and Walter Hancock—who only finished Borglum’s design in the 1970s, largely by effacing what he had accomplished. “Excavation became erasure,” Grigsby concludes, and scale was a powerful and frustrating factor in this sequence (86). In several ways, the best of Scale appears last. 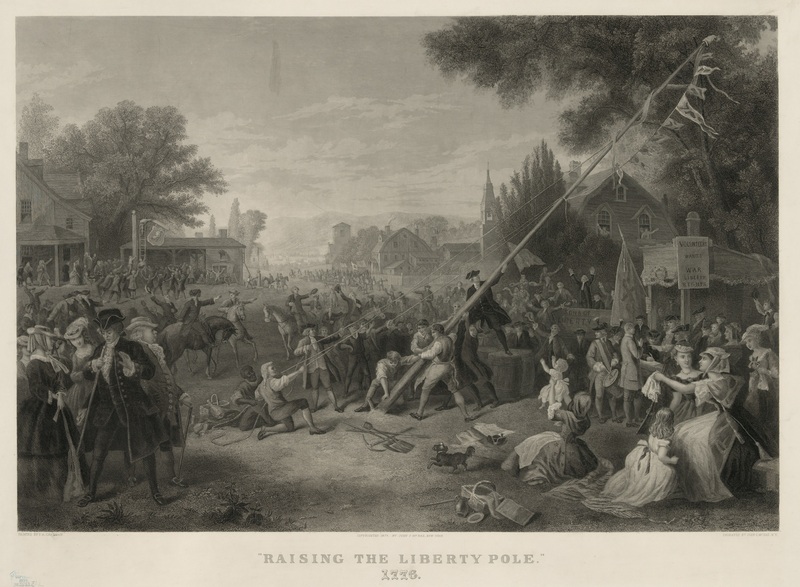 Wendy Bellion’s compelling essay “Mast Trees, Liberty Poles, and the Politics of Scale in Late Colonial New York” stands out among the many exciting pieces of interdisciplinary writing to be found throughout the Terra Foundation Essays. Bellion offers a succinct history of the pre-Revolutionary practice of raising liberty poles and shows how well documented this performance of colonial civil disobedience was in relation to these monumental, if temporary, forms (fig. 2). She assesses specific acts to show how “notions of scale informed this cycle of creation, signification, and destruction from beginning to end” and demonstrates that “for all concerned, scale was both a representational and a material practice” (218–20). Few of the contributors included in the series go further than Bellion in highlighting the contemporary value of their themes for a wide range of urgent thinking in our field that serves to connect the discipline to political activism and social justice. Her essay untangles the complex strands that ran between popular caricature, sculptural iconoclasm, natural science, and public rituals, resulting in a widely shared understanding of how “liberty poles [and trees] were allied, semiotically and functionally, to other forms of colonial activism” (235). Bellion then opens this inquiry up to applications within current debates and spaces. In noting the physically unremarkable yet enduring presence of a Liberty Flagstaff in City Hall Park, New York, illustrated as a final image in Bellion’s text, the author connects past practices to any number of contemporary events that call for courage and resistance, some of which are sited in the park. The stated goal of the Terra Foundation Essays, to “present original research by an international roster of scholars,” is most visibly fulfilled in the choice of François Brunet as steward of its third volume, Circulation. A prolific historian of visual culture and American history at the Université Paris Diderot, Brunet is a frequent contributor to Transantlantica, the online journal of L’Association Française d’Études Américaines, among other editorial qualifications. Of the six scholars represented in this volume, only one (Tom Gunning, The University of Chicago) comes from an institution in the United States. The rest are affiliated with universities in France (Brunet and Hélène Valence), Canada (Thierry Gervais), Ireland (J. M. Mancini), and the Netherlands (Frank Mehring). This observation may seem trivial, but it is worth recalling the stated objectives of the series and the difference this represents from other edited volumes in this series (none of which features more than two contributors with institutional affiliations abroad). Thomas W. Gaehtgens and Heinz Ickstadt previously observed that, “Until recently, American art remained almost exclusively the province of American art historians, and exploration in this realm by European scholars were the exceptions.”13 At the very least, Circulation suggests that historiographical progress has been made since that particular claim was first issued. There are still other reasons to appreciate the contributions of the third volume of this series. In keeping with the logic of production, circulation, and consumption, Brunet sets a high bar for the analysis of North American objects moving through space and time. His approach is a far cry from vulgar Marxism, where circulation might be viewed as a mere link between means of production and consumption. Brunet asserts that the book is “a long-term history of circulations in and of American art” as shaped by forces and situations both internal and external to the United States. He complicates this goal by offering that “circulation is not only a motion, it is also currency . . . reproduction, reuse, re-mediation, repurposing, and return of the same are components of circulation just as essential as physical transportation, as are non-circulation, suppressed circulation, and delayed circulation” (13, 32). This expanded definition both creates anticipation for treatments to follow and makes the territory covered seem potentially overwhelming. Gratefully, the contributors are up to the task. Valence’s essay “Repatriating James McNeill Whistler: The Circulation of Arrangement in Grey and Black No. 1: Portrait of the Artist’s Mother” offers a thorough account of the travels and various lives of this iconic work as an object of veneration, derision, humor, and circulation on a postage stamp. The author observes how “after Arrangement in Grey and Black was purchased by the French government, Whistler’s reputation in America changed dramatically,” improving not just as a simple result of the acquisition decision but, shortly after, by the artist becoming an officer in the Légion d’Honneur (123–24). Perhaps the best-known nineteenth-century work by an American artist held in a French museum (1871; ‎Musée d’Orsay), but also one seldom shared with exhibitions abroad, Whistler’s work has enjoyed a complicated status within domestic visual culture. This long after the artist—who, we should remember, once notoriously claimed “I shall be born when and where I want, and I do not choose to be born in Lowell [Massachusetts],”—was dead.14 Valence’s essay explains why circulation is fundamental to Whistler’s longevity as a producer of cultural icons. In the introduction, Brunet wonders why “noncirculations” and “invisibility” should not be a focus of Circulation, volume three, and asks whether these categories have the capacity to teach us just as much about the meaningful lives of representations. Mancini replies by choosing works that possess the quality of having virtually disappeared from art-historical consciousness. In her essay, “American Art’s Dark Matter: A History of Uncirculation from Revolution to Empire,” Mancini, like Valence, describes how images, especially those generated by conflict, become decentered through their movements, especially across time and borders. “Uncirculation,” according to this author, is a process by which objects “cease to have purchase on later viewers and makers” (45). First among her examples is an early album of French engravings, Recueil d’estampes représentant les différents évenemen[t]s de la guerre qui a procuré l’indépendence aux États Unis de l’Amérique (Collection of Prints Representing the Different Occurrences in the War That Procured Independence for the United States of America; Paris, c. 1783–84). In tracing the location of the prints along a trajectory of uncirculated objects, Mancini instructs us as to how once-popular and now “illegible” stories attended such representations. In this case, the lasting meaningfulness of the engravings resides in their visible difference from heroic narratives of colonial revolt and, ultimately, Mancini insists, their implication in a larger discourse of “interimperial war for supremacy among Britain, France, and Spain (and, to a lesser degree, the Dutch)” (47–48). This object study is juxtaposed with a consideration of Henry Cabot Lodge’s The Story of the Revolution, which dealt with the same revolutionary context but was published almost a century later. Designed first as a luxury book, then serialized for readers of mass-market journals, The Story of the Revolution begs to be understood in terms of Lodge’s outspoken advocacy of contemporary imperialist efforts, specifically the Spanish-American War and the conquest of the Philippines. In the end, Mancini suggests we can learn as much from this “dark matter of American art” as we can from triumphant images that have been firmly established within the canon (73). Experience covers the most diverse group of subjects to appear in the series thus far, in spite of its editor’s stated concern that the shared commitment of the field to investigate race, identity politics, social justice, and other issues has the potential to lead scholars away from important, if personal, revelations about their objects of study. Except for Frank Mehring’s extremely insightful essay on “How Silhouettes Became ‘Black’: The Visual Rhetoric of the Harlem Renaissance,” which closes this volume, there is a disconcerting blind spot when it comes to the treatment of artists of color and considerations of ethnicity in earlier compilations in the series. Experience opens with musings by Lucy Mackintosh about the presence of two Mãori flutes in the permanent collection of the Peabody Essex Museum. Her well-researched discussion of the collecting of these instruments as part of the sea trade, their deposit in the Salem museum’s precursor institution, and the progressive losses of specific knowledge about their actual uses over time, is fascinating. Mackintosh is more ambiguous about the ways that the presence of these objects implicates the museum in colonizing regimes, and nothing is really said about efforts to decolonize those spaces. While the Peabody Essex Museum apparently will not permit their own putorino and nguru flutes to be played, Mackintosh partly redeems a curatorial impulse to catalogue and shelve by recounting the host of other efforts by ethnomusicologists and indigenous people to reanimate similar flutes at other museums, quoting Fanny Wonu Veys: “These musicians and researchers have literally blown new life into them” (43). Jennifer Jane Marshall’s essay insists on the connections that exist between empathy and experience, especially as these relate to the discourse about race in the United States. “‘Ever Not Quite’: Empathy, Experience, and William Edmondson” emphasizes the haptic appeal of Edmondson’s stone carving practices but also insists that “the racial divide between Edmondson and his white audiences served to dramatize, at least for the latter, the many other divides bridged by the appreciation of his art” (106). Indeed, this black artist received significant attention from white curators, collectors, and members of the New York intelligentsia in spite of the fact that his most successful years coincided with the Great Depression. Marshall charts the interracial tensions that surrounded often fictionalized accounts of Edmondson’s life and shows how these latent and overtly racist ideas problematize the claims that were made for his oeuvre and its physical appeals. Touch, whether represented by photographs of the artist working or an imagined caress of the hard stone forms he created, may be an invited experience, but not one entirely free of complications. Marshall writes: “Of all the empathetic projections that Edmondson’s sculpture evokes, perhaps none is more powerful than the imagined re-experience of making—the community gathered around the site (and sight) of creativity . . . . [C]reativity recurs as a kind of drumbeat to the proceedings” (125). Finally, Xiao Situ’s perceptive attention to the many windows in Emily Dickinson’s Amherst home and Robert Slifkin’s examination of 1960s Minimalist displays share an interest in embedding experience decisively in the spaces that surround objects and can produce alertness in observers. Both of these essays prepare the reader for Nemerov’s short essay that concludes this volume, “The Hushed Place: Richard Choi’s Trampoline (2011).” In effect a meditation on a single work of art, Nemerov’s essay starts by extending terms he already laid out in his introduction: “A work of art’s power to convey experience requires that we feel two sensations: making and receiving. We must feel the world is made before our eyes” (190). This is very like what he describes having taken place in front of the Eakins portrait, and it seems hardly accidental that he subsequently argues for this feeling to be applied equally to contemporary, time-based representations. For some reason, however, Nemerov links Choi’s video to works by Edward Hopper and Gregory Crewdson as a form of conclusion to his short contribution, and in so doing he sacrifices the thrill that devoting time to something truly unfamiliar might deliver by returning to contextualization. That is a small quibble, for in the end, Experience highlights risk-taking and its accompanying insights. Remaining open to the motivations of artists and their creative breakthroughs, as well as our own bodily responses to the pulsing visual worlds that artists produce, is worth remembering. There are very few flaws that merit mentioning in a review of the first four books of the Terra Foundation Essays. Indexing the volumes would be helpful to scholarly use, but is not typical of series like this one. The typographical choices are a little quirky, but the overall design is neat and the amount of color illustrations seems generous. There are a few instances of scholarly repetition in the series, but these are trivial and resonate upon certain themes. For example, Mancini’s essay investigates the same iconoclastic violence toward statues of King George III that Bellion mentions in her work on Liberty Poles. This fact is remarkable when we consider that Picturing, Space, Circulation, and Experience were all edited by different academics and, presumably, at separate times. In spite of this, Rachel DeLue should be applauded for her work as series editor. Moreover, the small but highly gifted publications team at the Terra Foundation’s Paris bureau, especially Francesca Rose, deserve the lion’s share of credit for having launched a satisfying series on a short time frame and with elegant results.17 It seems likely that many of the original, well-crafted essays that comprise each of these volumes may soon find their way into syllabi and reading lists. In so doing, the claim for the Terra Foundation Essays’ relevance will start to be fulfilled. Picturing, scale, circulation, and experience serve less as tight thematic guideposts, or as organizing labels for new avenues of inquiry, than as open baskets for collecting diverse musings on longstanding problems within academic practice. That may be seen as a letdown, but there is substance to be admired within these neatly batched texts. The American art community has gained from this productivity and will continue to benefit from still further inclusivity in future contributions. A glance at the Terra Foundation website tells us that the fifth volume in this series—Intermedia—will be published in 2019. We look forward to its appearance and to others yet to be imagined. Cite this article: Derrick R. Cartwright, review of Picturing, Scale, Circulation, and Experience, Terra Foundation Essays, vols. 1–4, edited by Rachel Z. DeLue, Panorama: Journal of the Association of Historians of American Art 4, no. 2 (Fall 2018), https://doi.org/10.24926/24716839.1667.